David E. Eby, Eby Petrography & Consulting, Inc. 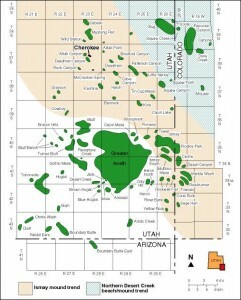 The Paradox Basin, which extends from Utah into portions of Colorado and Arizona, contains more than 75 small oil fields, each capable of producing 2 to 10 million barrels of oil. But variations in the reservoirs of these fields prevent recovery of up to 75 percent of that resource, using conventional extraction methods. This study will evaluate methods to extract as much as another 50 million barrels of oil from existing wells in the basin. It will consist of a geologic and reservoir characterization study of the Ismay and Desert Creek zones of the 300-million-year-old Paradox Formation. The goal will be to determine if horizontal drilling techniques can increase well productivity from thin, untested intervals of reservoir rock. Cherokee field in San Juan County will be a target for a detailed case study. The total cost of the project will be $1.03 million. Funding will come from the U.S. Department of Energy, the Utah Geological Survey, the Colorado Geological Survey, and private industry. The management and technical team, headed by UGS Principal Investigator Thomas C. Chidsey, Jr., will include Seeley Oil Company of Salt Lake City, the Colorado Geological Survey, and Eby Petrography & Consulting, Inc.
For more information on the Paradox Basin II Project, contact Tom Chidsey, (801) 537-3364, email: tomchidsey@utah.gov.